Over all the years I've been involved with making radio programmes some of the most thrilling moments have been when I've had a musician or band just inches away from me performing live, while I've been trying to capture the energy and get it on air. And I also like hearing live music on the radio. Maybe it's the tension of knowing there's no second take and the unknown factor of nor knowing just who is listening that means so many live to air performances positively crackle. In this episode I feature recording of live-to-air performances, some of which I've been involved with, and others that have either been commercially released or I've come across as a radio listener. On Waiheke Island,my home town, Three Legged Horse, now sadly gone, were a revelation on the local music scene. For years it seemed all you could hear were middle aged guys playing the blues but Three Legged Horse came along and they were something else. They had a grungy, angsty edge courtesy of songwriter Bede Taylor, anchored by the talented playing of Aaron Carpenter and fronted by stellar vocalist Gina Higham. They left behind a stunningly good album, Down, which can be bought at the band's bandcamp page. At Waiheke Radio we were huge fans of the band and they helped us out with fundraisers and the like. 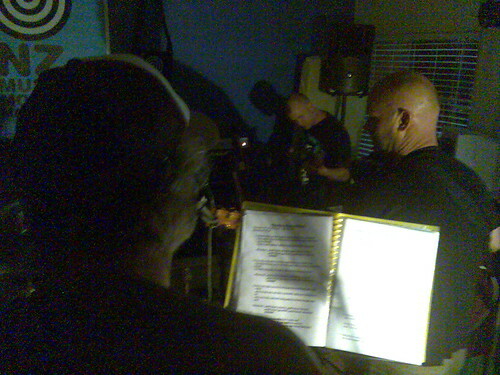 We got them in for a live-to-air session for New Zealand music month in 2009 (picture above by Pumicehead) and as well as original material asked them to perform a kiwi cover. Aaron was still listening to the tune on an ipod when he arrived but when the Horse played The Rock and Roll Machine's 'Slave' the performance was electric. Do you remember cassettes. The other day I stumbled upon a box of them that included a couple of cassettes of live-to-air recordings that I'd taped off the radio in the days before the internet and podcasts. I'd actually completely forgotten that I had taped a live-to-air by Body Bomb, a Dunedin band active in the mid nineties. They were a live favourite of mine who played extremely loud punk rock that pinned you to the back wall. As well as the live track featured on the podcast you can find a Body Bomb track on the website of band leader Victor Billot. The band also featured Tristan Dingemans of HDU but unfortunately the rest of the band members identities elude my memory. Fatal Jelly Space were a great Auckland band who released one great EP titled Hole on Flying Nun in 1990. They were a staunchly feminist outfit and a ferocious (if not somewhat scary) phenomenon live striking fear into the hearts of many. Around the turn of the century Bob Dylan played the god-awful North Shore Events Centre in Takapuna, Auckland. Ordinarily that wouldn't have grabbed me, but supporting him was none other than Patti Smith. As soon as I heard that I was there. She was better than I can describe here and I went away very happy. On the way back into town to catch the last ferry to Waiheke we saw someone hitching we recognised as coming from the island. We picked her up and got chatting and it turned out this fellow Patti Smith fan was Frankie Fatal of Fatal Jelly Space. So anyway, in 2003 I was putting together a series of live-to-air performances on Waiheke Island radio station, The Beach to mark NZ Music Month. I remembered that late night hitch-hiking encounter and approached Frankie about performing. She agreed, playing a great set of new songs and revisiting one of the tracks from the Hole EP, 'Miseriah'. Between 200o and 2002 Auckland alternative radio station bFM, long-time champions of NZ music, released a series of three CDs of recordings of live-to-air performances broadcast by the station titled Live and Direct Vol. 1 - 3. Most of the tracks were cherry picked from the station's NZ Music week specials, when they would broadcast dozens of live-to-airs over a week. Vol. 1 featured recordings from 2000, a year before Cassette released their classic Emo EP. Where Emo was all slow, Neil Youngesque country rock, 'Marty Squire', the live song featured on Live and Direct Vol. 1 is a much rockier affair, signposting a direction the band would take on later releases. Another legendary live-to-air performance on Waiheke Radio came from Tank and Pump, the band that emerged following the end of Three Legged Horse. Frontman and songwriter Bede Taylor gathered an eight piece behemoth around him, unleashing new levels of rock ecstasy upon the island. They pulled out all the stops when they crammed into Waiheke Radio's 3 x 3 m office (pictured above, photo by Pumicehead) and delivered an amazing hour long on-air live performance. They've since kept up their reputation as a phenomenal live outfit, most recently performing with celebrity fan John Hawkesby. Whether it's on DAT in the back room cupboard of radio stations, or boxes of cassettes in the attic of music fans like me, I get the feeling there are many, many amazing live performances of New Zealand bands floating around out there and I think it's time we dug them out and had another listen.